"Why is this promise of a new existence in a new world so central to all that we believe? What good would our faith be without it?" Good morning, friends. Welcome again to Sabbath School Study Hour here at the Granite Bay Seventh-day Adventist Church. I'd like to welcome those who are joining us across the country and around the world, part of our Sabbath School Study time, also our online members, and our regular Sabbath School members that are here in person, and the visitors who are joining us today. Very warm welcome to all of you. Over the past 12 weeks we've been studying a great book in the Bible. Matter of fact, it's the last book of the Bible, the Book of Revelation. Today we come to the end of our Sabbath School quarterly dealing with the Book of Revelation. Our study today is lesson number 13, it's entitled, "I Make All Things New." So that's what we'll be studying this morning. But before we get to our lesson, I'd like to let those of you here in person know about our new quarterly that starts next week, dealing with "Family Seasons" is the name of the lesson quarterly. For our regular Sabbath School members, you'll be able to pick up your copy of our new lesson quarterly in the church foyer. And be sure to take a look at that, prepare for next week studying our brand new lesson quarterly. We have a free offer, we'd like to make available to those who are joining us online and those around the world. It is "A Colossal City in Space" is the name of the Amazing Facts Study Guide. In order to receive this, please call 866-788-3966 and you can ask for offer number 115. We'll be happy to send it to anyone in North America, or you can text the number, or text the code "SH122" to the number 40544. And you'll be able to get a link to download this study guide dealing with heaven called "A Colossal City in Space." Well, before we get to our lesson, let's begin with a word of prayer. Dear, Father, indeed, we are grateful that we have this opportunity to study Your Word together. Thank You for this beautiful Sabbath, and also for the scriptures, in particular the Book of Revelation, which is our subject today. Talking about the home of the redeemed and we ask Your special blessing as we look at this wonderful subject. We ask this all in Jesus' name. Amen. Now for those of you who have been joining us over the past few weeks, you probably know by now that the Book of Revelation is one of my favorite books in the New Testament. And I think you also know that it's one of Pastor Doug's favorite books in the New Testament. So we've been doing a little bit of dual teaching on the subject. So, Pastor Doug, we invite you to come forward and we'll get ready for our study today. Thank you, Pastor Ross. And again, wanna welcome everybody and, you know, we have a number of people who are really online members of Granite Bay, wanna welcome them as well. As we travel, we frequently run into folks who say there's no local church I can attend. Some of these folks are shut-ins, and there's no church nearby, and they say this study is their Sabbath School program. And so we wanna give you a special welcome. If you're interested in what you might do, if you wanna be one of our online members, you can simply go to granitebaysda.org and there's some information there. Now as Pastor Ross mentioned, our study today is the last in our quarterly on Revelation. We did something different this time because any Adventist pastor worth his salt has sermons on Revelation. And not only do we have sermons, we got slides, but we've got slides on each chapter. Now I don't know often do this, but I want to take issue with the publishers of the Sabbath School quarterly because they want us to cover the millennium in 50 minutes today. Millenniums are 1,000 years. It's really hard to cover 1,000 years in 50 minutes. But we not only have Revelation Chapter 19 to cover, we've got Revelation 20, which is where you find the millennium, 21 and 22. So you pray that we could experience time travel right now and we'll see how far we can get. We've got a presentation, we're gonna do the little tag team, gonna be going through the slides on our study today, and we haven't rehearsed this. We'll take turns reading some of the scriptures. I'll let you know in advance, we have 125 slides that we're gonna try to get through. So let's get right into it. Our lesson today is lesson 13, "The Book of Revelation, Jesus making all things new." Our mission is to kind of cover Chapter 40, I'm sorry, Chapter 19 through the end of the book. And we have a memory verse. And the memory verse is Revelation 21:5, if you'd like to say that with me, you have it on the screen and in your Bibles. I believe this is the New King James Version. Here we go. "Then He who sat on the throne said, 'Behold, I make all things new.' And He said to me, 'Write, for these words are true and faithful.'" All right, in the first section here is talking about The Wedding Supper of the Lamb. Now in the previous chapters, we've noticed that just a lot of things have happened and there's lot of overlap in Revelation. When you get into the seven last plagues, you're entering the end of time, there's an all out effort made by the beast power. Well, if they can't buy or sell, they don't cooperate, they should ultimately be killed. And just as this critical moment come is when they're going to be destroyed. God intervenes and fights for them. Now do we see that happening many times in Bible history at the last minute, when it looks like it's hopeless, they're at the Red Sea? And the enemy's coming, they're all about to be slain. God turns the tables, so they're not only delivered but the enemy is slain. The Book of Esther, a date is set when all of God's people will be killed. But at the last minute Esther intercedes with the king, and that's a very strange occurrence with the dinner with Haman, and the King, and Esther, and instead of Mordecai being hung, Haman is hung on Mordecai's gallows, and instead of God's people being destroyed, the enemies of God's people are destroyed. Even though it looks hopeless, God turns the tables at the end. This is what happens at the end of the time. God's people who smaller in number than the multitudes of lost. Death decree and when it look like they're about to be annihilated, Jesus comes at the last minute to deliver. And that's where you get this picture here in Revelation 19. You wanna read this verse, Pastor Ross? Oops! I just, I went backwards, right? There you go. It says, "Let us be glad and rejoice and give glory to Him, for the marriage of the Lamb has come, and His wife has made herself ready. And to her it was granted to be arrayed in fine linen, clean and bright, for the fine linen is the righteous acts of the saints." So you'll notice that the Second Coming of the Lord and this event is referred to as a marriage, and you'll find as we go on it's talked about. New Jerusalem is compared to bride adorned for her husband. This language is also found in John 14:1-3. Now you all know this, Pastor Ross will read it for you. John 14, beginning in verse 1. It says, "Let not your hearts be troubled, you believe in God, believe also in Me. In My Father's house there are many mansions, if it were not so, I would have told you. I go to prepare a place for you. And if I go and prepare a place for you, I will come again and receive you to Myself, that where I am, there you may be also." So the Second Coming of Jesus is sort of in the context of a Hebrew wedding. What would happen in the Hebrew wedding is the groom might give the young lady a cup of grape juice. And as she drank from it, there was a ceremony where she accepted the proposal. Any one of you been to a Jewish wedding where they fold the glass and the man stomps on it? It means no one else is to drink from that glass after the two of them drink from it. And then he was to go, that wasn't, the honeymoon didn't happen right then. Then he was to go to his father's house and build a honeymoon chamber on his father's house. When that was done and they never knew exactly when it was done, he would come and pick up his bride. So the language here that you see in John 14 is the language of a wedding. And so Christ is saying, would a groom build a honeymoon chamber and then say now what am I supposed to do with this? Is there someone I'm supposed to pick up, who would that be? He's saying, "I'm not gonna forget about you, anymore than a groom would forget about his bride." You know, Pastor Doug, in Matthew Chapter 22, you can read the same idea of a marriage where it talks about a certain king arranging a marriage for his son. And all the guests who were invited and they came into the marriage hall, it was finally filled with guests. Then it says, the king came in to see the guests, and he saw a man that didn't have on the wedding garment. The king said, "How did you come in here, not wearing the wedding garment?" If you read the story, it says, the man was speechless, probably because he was given the wedding garment, but he didn't take the time to put it on. And then the judgment is given, take him, bind him hand and foot, and throw him out. So here you have the likening of a wedding, at least a wedding gathering, and celebration, and that's the Wedding Supper of the Lamb. Just prior to this, there is a judgment that occurs where the king comes and examines the guests. Well, we understand from Bible prophecy that we're living in that time of examination or judging. That's why Revelation Chapter 14 says, "Fear God, give glory to Him, the hour of His judgment has come." So we see a parallel there with Matthew Chapter 22, as well as the promise that Jesus made in John Chapter 14. Yeah, so we have Jesus coming then in Chapter 19, He's riding on His white horse, He's coming to rescue His bride. You remember, if you read in Chapter 12, there's this beautiful woman clothed in light, and the dragon is not only wants to devour the child, but he can't, so he then exerts his fury on the woman. And so this is where, it says here, Armageddon ends, but it's really Armageddon ends on earth. Armageddon is a battle that actually goes over into the end of the millennium as well, a couple of different battles of Armageddon, you might say. So Jesus is coming. He's the rider on the white horse who comes to rescue and you read in Revelation 19:11, "Now I saw heaven opened, and behold, a white horse. And He who sat on him was called Faithful and True, and in righteousness He judges and makes war." Now keep in mind, things are happening in quick succession, it says he makes war. What do you read at the end, Revelation 12:17? "And the dragon was wroth with the woman, and he goes to make war." So it's in this war, the dragon against the woman and Christ against the dragon finally culminates in this battle of Harmageddon or Harmegideon, they're not sure if it's a reference to Gideon's battle in Megiddo or the Valley of Megiddo. Both cases it was a time where God completely turn the tables and delivered His people. The first time Jesus came, He came as our Savior. He came as a babe born in Bethlehem. But the second time Jesus comes, now it's described as Him coming on a white horse as King of kings and Lord of lords. He's coming as a victorious conqueror to deliver His people. And when that happens it says the wicked are destroyed with the brightness of His coming. We'll probably get to that in just a few moments. So Jesus comes now not as a suffering servant but as a conquering King. All right, and then His coming, we've had a study on this, that we're caught up to meet the Lord in the air. And then you enter Chapter 20. And let me just read, I'm gonna read verses 1 through, this is the millennium. The word millennium is a composite of two words, milli meaning thousand, annum meaning years. Then I saw, and the word millennium is not found in the Bible, just like you don't find the word Bible in the Bible, or rapture, or Trinity, a lot of teachings are not found in the Bible. The teachings are there, the words aren't there. "Then I saw the angel coming down from heaven, having the key to the bottomless pit and a great chain in his hand. And he laid hold on the dragon, that serpent of old, who is the Devil and Satan, and bound him for a thousand years, and he cast him into the bottomless pit," we'll talk about what that is, "and shut him up, and set a seal on him that he should deceive the nations no more until the thousand years are finished. But after these things he must be released for a little while." All right, so now you'll see on the screen, we got one, this is like question one, we're gonna be teaching with the Socratic method. And there's gonna be about 20 questions. You have 20 questions. That's what we're doing. And it will sort of be answering these with scriptures. All right, first of all, what marks the beginning of 1,000 years? May be Pastor Ross will read this verse for us. 1 Thessalonians 4:16, "For the Lord himself shall descend from heaven with a shout…" And then it goes on to say, "And the dead in Christ shall rise first." So one thing that happens to mark the beginning is there is the coming of the Lord, there's a resurrection. And what happens then? Revelation 20:4-5. And we have a couple of slides on this verse, Pastor Doug, it says, "And they lived and reigned with Christ for a thousand years. But the rest of the dead lived not again until the thousand years were finished. This is the first resurrection." So if the dead in Christ rise when Jesus comes, who are the rest of the dead? The only option if you take away all the righteous, who are the rest, it's the wicked. And so the wicked, they do not rise in the first resurrection. And you read a little later in Chapter 20, it tells us that, "The rest of the dead don't live again until the thousand years are finished." And a 1,000 years I mentioned, it's mille, annum, that represents simply a 1,000 years, starts with the first resurrection and it ends with the second resurrection. So the 1,000 years, the main thing that separates them like bookends is two resurrections. Now when I first heard that, it kind of surprised me. I always thought there was a resurrection. Then I realized Jesus said, "Don't marvel, but the hour is coming in which all that are in their graves shall hear his voice they that have done good, the resurrection of life," I think it's John Chapter 5, "they that have done evil, the resurrection of damnation," two resurrections. Daniel Chapter 12, "Many that sleep in the dust of the earth shall awake, some to everlasting life, some to shame and everlasting contempt." And so all through the Bible, it tells us, there's really two resurrections. You don't want to be in the second resurrection. It's also interesting to note that each resurrection is connected with a coming of Christ, the Second Coming, you have the resurrection of the righteous, then we have what we call the Third Coming at the end of the 1,000 years where the New Jerusalem comes down out of heaven. Then you have the second resurrection, which is the resurrection for the wicked. So connected with the resurrection is the coming of Christ to the earth. All right. What else happens at the first resurrection? Okay, you wanna read that? 1 Corinthians 15:51-53, it says, "We shall not all sleep, but we shall all be changed, In a moment, at the last trump, for the trumpet shall sound, and the dead shall be raised incorruptible, and we shall be changed. For this corruptible must put on incorruption, and this mortal must put on immortality." All right, so there's the resurrection we were talking about. Now what kind of bodies do the raised have when Jesus comes? Philippians 3:21, "Who will change our vile body, that it might be fashioned like unto his glorious body." What kind of body did Jesus have, when He rose from the dead? How many remember when He appeared in the upper room to the apostles and they were scared 'cause they thought they saw a ghost. Then He asked, you have anything to eat and He ate in front of them, He says, "A spirit doesn't have flesh and bone as you see that I have." So did Jesus have a real body? Will we have real bodies? Did Adam and Eve have real bodies? Isn't the whole idea that the Lord is gonna restore His original plan. So the idea that when He comes, we're all kind of ethereal ghosts that are disembodied, and we're living in the bosom of Abraham for, you know, while, that's really not taught in the Bible. You can read in Luke 24:39, with this is when Jesus appeared to the disciples in the upper room. "Behold my hands and my feet, that it is I myself, handle me, and see, for a spirit hath not flesh and bones, as ye see me have." Okay. And then you read in 2 Thessalonians 2, then what happens to the wicked? Those who are dead are raised, those who are alive are transformed. What about the wicked when Jesus comes? It says, "And then shall that wicked one be revealed, whom the Lord shall consume with the brightness of his coming." And the whole world is imploding at this point. Go ahead, Pastor. Revelation 16 says, this is 16:18, 20, 21, it says, "And there was a great earthquake, such as not since there were men upon the earth, so mighty an earthquake, and so great." It says, "Every island fled away, and the mountains were not found. And there fell upon men a great hail out of heaven, every stone about the weight of a talent." That is some 75 pounds. And we did Amazing Fact of the radio program last week about a recent this year, hailstorm in Texas, where they had baseball sized hail. And it did like $450 million worth of damage to homes and cars, it just destroys cars when that happens. So it's really gonna happen. All right, Revelation 20:1-2, this is where we read that at this point, this is where Satan is bound. Or let's find out what it means when Satan is bound. "That old serpent called the Devil and Satan, and binds him a thousand years." So the word is, he's bound in the abussos and the King James translators, for whatever reason, they chose the word bottomless pit to describe this. Now it's something of a mystery why they chose that word because the same word is translated in other places. For example, some of you read in Luke 8:31, the story of the demoniac, Pastor Ross, you wanna read that? It says, "And they besought him, that is Jesus, that he would not command them to go out into the deep." There's this demon possessed man and the demons asked Jesus don't send us out into the deep. The word deep there is abussos, same word in Revelation 20. It simply means a place where devils have no one to tempt and manipulate. And for 1,000 years, Satan has no one to tempt and manipulate. It's not some black hole or cavern of in the cosmos where Satan is chained in this big abussos. He is on the world. Now there's some other verses that explain that. You realize when God made the planet in the beginning, the Septuagint. You know, when it says the earth was void without form in Genesis. The Greek version says the earth was in abussos. And so it's describing the world. Think about the condition of the earth after Jesus comes. All the righteous, where do they go? It says they go up. Christ said, "I'm coming to receive you unto myself that where I am you may be." What happens to the wicked? The wicked who are dead, stay dead, the wicked who are alive are destroyed by the brightness of His coming. So how many people are alive on the planet? None. And the Bible says the heavens ceases to shine. It's a dark, destroyed chaos. And this is where Satan is bound. Talks about the cities being broken down by this great earthquake and the destruction from the hail. And, of course, all the wicked are destroyed. The earth is dark, empty, broken down, and here is the devil, and his angels bound on planet earth for 1,000 years. Yeah. I think we've got those verses coming. It says who will be raised in the second resurrection, and what takes place? We covered this pretty well already. "Those that are in the graves will hear his voice and come forth, those that have done good, resurrection of life, evil, the resurrection of damnation." And what happens to the rest of the dead? You wanna read that? Revelation 20:5, "But the rest of the dead, that would be the wicked, lived not again until the thousand years were finished." Which means they do live after the 1,000 years are finished. You want to read that question? Question number four says, in what condition will the earth be left after the devastating earthquake and the hailstorm that begins the 1,000 year period? And we touched on a few of these, but here's the actual verses, Isaiah 24:1, 19, "Behold the Lord maketh the earth empty, and maketh it waste and turneth it upside down. The earth is utterly broken down." And there's that verse you have in your mind. Yes. Jeremiah 4:23-26, it says, "I beheld the earth, and, lo, it was without form, and void, and the heavens, they had no light. I beheld the mountains, and, lo, they trembled, and there was no man, and all the birds of the heavens were fled. And the fruitful place was a wilderness, and all the cities thereof were broken down," notice the next part, "by the presence of the Lord, and by his fierce anger." Yep. And then in Jeremiah 25:33, "And the slain of the Lord shall be at that day from one end of the earth even unto the other end of the earth, they will not be lamented, or gathered, or buried." Why? Nobody to conduct the funerals. First time in history, no funeral parlor will be open. Now, the left behind scenario, you know, what I mean when I say the left behind scenario? You know, a lot of dear evangelicals believe that there's gonna be a secret rapture. How many of you are aware of that? And that the saints are caught up. There's a time of trouble for seven years here on earth, the middle of that seven years the antichrist isn't thrown in the temple, the Jews are preaching the gospel, the plagues are falling. At the end of that, Christ comes down here on earth, He establishes His earthly kingdom and the 1,000 years are spent here on earth. Now, that's a pretty big difference. For one thing, we along with many traditional Protestants believe the 1,000 years we live and reign with Christ in heaven. Says, I'm taking you to my father's house. I'm taking you away when the resurrection happens and that time begins. The other group thinks we spend the 1,000 years here with a righteous reigning over the wicked. We've got immortal bodies, but they don't, so they continue to be born and die. Why would you want to reign over the wicked? Now one reason I mentioned that is according to these verses we just read, there is a time Isaiah said, the earth is utterly emptied, the slain of the Lord cover the earth from one end to another, all the cities are broken down, there is no man, there is a time prophecy tells us when the earth is totally depopulated. The left behind scenario makes no provision for that time, it just, they can't explain it. It doesn't appear in their chronology. And so that's one reason I've got problems with that. All right, let's move along here. You wanna read that one? Question number five says, where will the saints be during the 1,000 years, and what will they be doing? John 14:3, Jesus said, "I will come again, and receive you to myself, that where I am, there ye may be also." Revelation 20:4, "And I saw thrones, and they that sat upon them, and judgment was given unto them, and they lived and reigned with Christ a thousand years." So we're enthroned, not here on earth, but we are living and reign. Where is the New Jerusalem now? It's in heaven. That's where Christ lives. That's where we'll be during that time. And we live and reign with Christ and we're doing, we're involved in something, some act of judgment. Now, we had to pause here on this slide for a minute. It says there, 1 Corinthians 6:2-3, "What, don't you know that you will judge angels that the saints will judge the world?" Now that doesn't mean we are deciding who is saved and lost. But in one sense, we are affirming the judgments of God, but we're also gonna be doing some evaluating. For example, someone said once there's gonna be three surprises when you get to heaven. First surprise is that you're there, and second surprise is there's some people there you never thought would be there. I always thought, just imagine the look on Stephen's face. You know, Stephen, the first martyr. When he gets to heaven, he sees a big parade and he is asking the angel, "What's going on?" They said, "Oh, they are honoring one of the great apostles." He said, "Really? I wonder, is it Peter? Is it Mathew? Which one is it?" He goes over, he sees they're carrying Paul around. And Stephen says to the angel, "You guys have made a terrible mistake." Last I saw him, he was public enemy number one trying to destroy the Christian Church. And the angel says, "Here, let's show you what happened." It's all your fault, Stephen. You prayed that God would forgive him and He did, and he was converted. And now he became an apostle. He wrote half of the New Testament. So you're going to have questions and you're going to look at the books and those things will be answered. And then there'll be some people who you thought would be leading the parade and they're not there at all. And you think, "How come that pastor, that evangelist, that great Christian is not there," or may be a family member. And the angel will say, "Come, we'll show you the books." And we will be looking that are judging the judgments of God in a sense and looking at the books and seeing this person had some unrepented or unconfessed sin that they hid from everybody but not from God. That's why Christ said, the hour is coming when those things are done in secret will be proclaimed from housetops. The secret things will be made plain. Everything is going to be exposed to that point. So this is the time of judgment going on. Now the Bible speaks about a time coming, and we'll get to that a little later where every tear will be wiped from every eye. But it's interesting to note that that occurs at the end of that 1,000 years. In other words, there might be some concern, there might be some feelings of sadness. During this 1,000 year time period where you're reviewing as Pastor Doug mentioned, the records and maybe there are people that you thought would be there that's not there, but the angel will come and explain to you why they're not there. So it's a time of investigation, it's to have every question answered that the righteous would have. All right. So what else happens at the close of the 1,000 years? You read in Zechariah 14 and this is verse 4, 5, 9, we're just taking some excerpts here. "The day of the Lord will come and his feet will stand and that day on the Mount of Olives which is before Jerusalem on the east and the Mount of Olives will cleave in the midst." So where's the last place Jesus' feet touched when He ascended to heaven? Mount of Olives, right? And where He says, "I'm going to come as I left." He even comes back when He actually touches the earth to the very same place. Where did the Lord predict the Second Coming to the disciples in Matthew 24? From Mount of Olives. Where did He weep in the Garden of Gethsemane? That's on the Mount of Olives. So it's a very special location. By the way, it's most expensive cemetery in the world. It's the Mount of Olives. Because even the Jews believe the Messiah will come because of this verse. They all want to be buried where the Messiah's feet are going to touch. You wanna read that? Revelation 21:2, "And I saw…" John writes, "And I John saw the holy city, the New Jerusalem, coming down from God out of heaven, prepared as a bride adorned for her husband." And so here is that verse where after Jesus' feet touched the Mount of Olives, there's an earthquake, it creates a great plain. It must be very large 'cause you'll see in a moment the dimensions of the New Jerusalem are roughly 1,500 miles, around 12,000 furlongs. I think that's 375 miles on each side. And by the way, didn't Jesus promise to Abraham that you will inherit this land? But he was a pilgrim, and he said… You know, he didn't really get to inherit it during his life, But he looked for a city that had foundations. That's also Moses, whose builder and maker is God. The borders of the land that God promised to Abraham will all be encompassed within the dimensions of the New Jerusalem. So they really will literally get that spot. Pastor Doug, before we go on to the next question here, just to add one more thought on that. It's interesting there's a principle that you find in the Bible in 2 Peter Chapter 3. Peter writes, "But beloved, do not forget this one thing, that one day with the Lord is as a thousand years." And a thousand as one day I should say, a thousand years and a thousand years is as one day. That's the principle. "Thousand years is as one day with the Lord." Then he goes on in verse 9, "The Lord is not slack concerning His promise, as some count slackness, but is longsuffering towards us, not willing that any should perish, but that all should come to repentance." Then it says, "But the day of the Lord will come." Now we find an interesting principle in the Bible where you work for six and then you rest on the seventh. God created the earth in six days. He rested on the seventh day. So we have the earth inhabited for about 6,000 years. Then Jesus comes and the righteous get to go to heaven for a 1,000 years, a Sabbath rest in heaven. Then at the end of that, the end of the 1,000 years, then the New Jerusalem comes down from heaven, and that's where the wicked are resurrected for the final judgment. So we see an interesting principle of sevens in the Bible and it ties into this 1,000 year period as well. Yeah, you know, God told Adam and Eve in the day you eat thereof, you will surely die. How long did Adam live? Did any? Who's the oldest man who ever lived? Actually Methuselah's son Enoch because he's still alive. That was a trick question, but you know what I meant. So the oldest… Methuselah is the oldest man who ever died, not the oldest man who ever lived. So did any man ever live beyond one millennium? In the day you eat thereof, you will die. Six days you work, a 1,000 year rest. At the end of the New Testament it tells us the children... I'm sorry, the end of 2 Chronicles, it tells us the children of Israel were carried off to Babylon for 70 years and while they were in Babylon the land kept Sabbath while it was desolate. The land was desolate and it kept Sabbath. What is the condition of the world during the 1,000 years? Desolate. It is keeping like a 1,000 years Sabbath at which point God makes a new heaven and new earth. And maybe we'll even get to that today. Okay. What will happen next to free Satan from his prison? Want to read that? Revelation 20:5 says, "But the rest of the dead lived not again until the thousand years were finished." So this would be the wicked. Revelation 20:7 says, "And when the thousand years are expired, Satan shall be loosed out of his prison." So what's in prison, Satan, is he's had nobody to tempt or manipulate. He and his demons all have to put up with each other. And can you imagine those conversations. The demons are saying, "Lucifer, you told us if we followed you, things would go better, that we could overthrow God, that we would have more power." And they're chasing him all over the planet 'cause they're really mad. So at the end of the 1,000 years, now they've got someone to tempt and manipulate again. You remember the demon said to Jesus, "Don't cast us into the abussos, cast us into the pigs. Give us something to tempt and to manipulate." And just quick little amazing fact I dropped in here. People are wondering, why doesn't God just destroy the devil when he comes? Why is He giving him a 1,000 years and letting him out of prison? You know, Napoleon, he kind of rampaged all over Europe and tried to establish the dominion of the Romans once again. He was defeated by the European powers and they sent him to Elba. But he escaped after about nine months. Came back to France relaunched the battle that took about a 100 days, and at Waterloo he was finally destroyed. Then they sent him to St. Helena in the middle of nowhere where he died five years later. But it's like when he came back, Napoleon couldn't change. He went right back to war, and it's amazing they didn't just kill him but they twice they sent him off. But this is what the devil does. God says, "I'm going to show the universe, I have no choice in dealing with the wicked other than what I'm doing" because as soon as Satan's out of his prison, he goes back to his bad behavior which we're about to see happen here. Something else very interesting happens during the 1,000 years. You have a clear distinction between two kingdoms. You have the kingdom of God and it's in heaven where the righteous are and they're living and reigning with Christ for the 1,000 years. And the direct opposite of that is Satan's kingdom. And what's happening in his kingdom? Well, it's all broken down. There's death everywhere. It's the cave, there's darkness. And so before the whole on-looking universe, it's quite clear the kingdom of God versus the kingdom that Satan wants to establish. It's clear in everyone's mind that indeed Satan's way results in death, destruction, and sorrow. So when that judgment occurs at the end of the 1,000 years, there's no lingering question in the mind of any person in the universe as to, is God fair and just. It's evident that yes, God is fair, He's done everything He can to save mankind. And He has no choice. Everyone understands God doesn't want to do it. All right question eight, what will Satan do when the wicked are raised? Again, go ahead. It says, Revelation 20:8, 9. "And he shall go out to deceive the nations which are on the four corners of the earth Gog and Magog to gather them to battle: the number of whom is as the sand of the sea." I just want to pause here real quick, Gog and Magog. People are thinking, who's Gog and Magog? You go back to the Old Testament and it talks about Gog and Magog. You read about them in a Ezekiel Chapter 37, 38. You find them in, I think it's Genesis 10 and the genealogies. They were ancient enemies of God's people. Now you're going to meet… You'll hear some evangelical pastors that are going to say Gog is the Chinese and Magog, that's Moscow, that's the Russians, and they're going to come together and attack Jerusalem, literal Jerusalem. And it's, you know, it's very popular, but it's not at all biblical, Gog and Magog. Keep in mind the names in Revelation are almost all spiritual. They're all symbolic. Gog and Magog were ancient enemies of God's people. You read in Ezekiel that they cover the earth like a cloud. They attacked the city of God. There's no battle in Old Testament history where Gog and Magog did that. And so here, but those names are used to sort of be a summary of the Ammonites which were the people that inhabited Canaan that they were going to attack the City of God. And they covered the earth like a cloud because it's all the wicked who've ever lived are resurrected. It says, "And they went up on the breadth of the earth and they compassed the camp of the saints about, the beloved city." Now just before they launched their attack, something interesting happens. Oh, by the way, here's that I told you in Ezekiel 38 talks about Gog and Magog. "Thou shalt come up against my people of Israel, as a cloud to cover the land." Same language you find in Revelation is what Ezekiel is prophesying about. "At this crucial moment what stops everything?" Revelation 20:11, 12, "And I saw a great white throne and he that sat upon it and the dead were judged out of those things which were written in the books, according to their works." All right, so I'll give you a picture real quick. At the end of the 1,000 years, the New Jerusalem comes or, well, first Jesus comes down, He touches the feet, His feet on the Mount of Olives, great earthquake creates a great valley. The New Jerusalem then settles into that valley and Christ at that moment, when He comes back to earth, all the wicked who've ever lived are called back to life for judgment. Remember, we said, all right, Bible says the rest of the dead don't live until the 1,000 years are finished. Meaning, when the 1,000 years are finished, they do live. Now Satan sees this vast army. Imagine how many people are in the world today? Almost 8 billion. This is all the wicked who've ever lived through history. Billions of people. And he thinks, you know, we assume some of those are safe. But there's a lot that are lost, they've gone the wide road to destruction. And Satan sees his army and, you know, you probably have Napoleon there and Hitler, or maybe Alexander the Great, Julius Caesar, you've got the great leaders and military minds and we don't know how long this period is, it calls it a little season. And He says, look, there's so many of us, we outnumber the ones in the city, we can conquer them. And so, before he launches this attack, maybe they have time to build armaments. But before they launch this attack on the city of God, Christ is exalted above the city. He appears on a white throne and they see Him in all of His glory, and everyone's lives pass before them. And there's a panorama of Christ's sacrifice in the heavens where we all see the gospel and the battle between good and evil laid out before us. You know, sometimes we picture the White Throne Judgment. We think that you're waiting in court like you're at the DMV, you're in a long line. One by one they hit the gavel and say next. Take your number, next. You think how long that judgment would take. Can God save a 1,000 people at once like at Pentecost. Can He judge a billion at once? Yeah, so that's what's going to be going on during this time, and everything is written in books, and that's why you want your name in the book of life. Question number 10 says, "What will happen after the wicked are judged?" Romans 14:11, "As I live saith the Lord," this is amazing verse, "every knee shall bow to me, and every tongue shall confess to God." So at the conclusion of this judgment when everyone sees that Christ was just, that He did everything He could to save every individual. Ultimately they're going to see Christ in His glory. Everyone will bow, everyone outside the city, everyone inside the city. You realize there is a time when we will all be together again. No matter what happens after today, everybody, saved or lost will be together again because this is the crucial moment when Christ separates the sheep from the goats. All the saved, God and the good angels are in the city, all the lost, Satan and the bad angels are outside the city. So everyone involved in the plan of salvation is there and every knee will bow to Christ at that point and confess that He is God. And here's another one from Philippians. Philippians 2:10, 11, it says, "That at the name of Jesus every knee should bow, of things in heaven, and things in earth, and things under the earth, and that every tongue should confess that Jesus Christ is Lord, to the glory of God the Father. So once that great confession happens, you can read in Revelation 19:1, 2, "I heard a voice of much people in heaven saying, true and righteous are thy judgments." Everyone is going to agree with what God has to do next, which is the judgment of the wicked. What will happen next? All right, Pastor Ross. Revelation 20:9 says, "Fire came down from God out of heaven and devoured them." Revelation 20:15, "And whosoever was not found written in the book of life was cast into the lake of fire." So as this fire rains down everywhere outside of the city of God. You remember when the plagues fell on Egypt. Sometimes God protected Goshen, nothing happened to God's people in Goshen, but it rained fire and hail on the Egyptians. And God is able to do that. You ever see it rain across the street but not on your house? You know, Pastor Doug, Jesus said to Nicodemus in John Chapter 3, "Except a man be born of water and of the Spirit, he cannot enter into the kingdom of God." Of course, water is symbol of baptism, the Spirit, the Holy Spirit. It's also interesting to note that the earth, it was washed with water during the time of the flood and now the earth is washed with fire at the end of the 1,000 years. Just like in order for us to be born again, we need the water and the fire, so the earth to be recreated, you have the washing of the water and the washing of fire at the end of the 1,000 years. Then the earth is recreated. It's a new heavens and a new earth. And we've got a picture of the earth being washed by fire right there. Revelation 20:14, it says, "This is the second death." So as the wicked are cast into the lake of fire. Do they burn forever and ever? The Bible says, "Every man is rewarded according to his works." And so different works, different periods of suffering, different intensity, different time. Who do you think will burn and suffer the longest? Satan and Idi Amin and a few others, Joseph Stalin, Adolf Hitler. But then it says this is the second death. Now who is it that said, if you're only born once you will die twice? But if you're born twice, you only die once, unless you're alive when Christ comes and you're saved. So just review the millennium. You've got the first resurrection, starts the beginning of the millennium. The second resurrection marks the end, the first coming. Then you got like a second coming when the holy city descends. Question 12. Go ahead and read that. After the fire goes out, what will God do for His people? And the verse there is Isaiah 65:17, "For, behold, I create a new heavens and new earth." Here's where it gets happy. Revelation 21:1, "And I saw a new heavens and a new earth: for the first heaven and the first earth were passed away." Now why does it say new heaven? Does that mean that the heaven where God lives now, there's something wrong with it. That word heaven there is a word for atmosphere. Remember, in the beginning, God separated the waters from the waters by a heaven. It means, He put an atmosphere in there. And so when He says, I make a new heaven, He says, a new earth, a new atmosphere around the earth, the air that we breathe, the place where the birds fly. That's sometimes called the first heavens in Hebrew literature. "So we're looking for a new heavens and a new earth wherein dwells righteousness," 2 Peter 3:13. Where will God and the righteous finally live. Revelation 21:3, it says, "Behold, the tabernacle of God is with men, and he will dwell with them." Wow! That just always leaves me speechless, that of all the infinite cosmos that God has created, He's going to move the capital to our world. Sin has separated us from God, but through Christ we're going to be reunited, not only where we can commune with God, but He is going to dwell with us. And God Himself will be with them and we shall see His face. Can you fathom that what that's going to mean? This one little planet in rebellion against heaven right now under Satan's dominion after the plan of redemption is made its full will be elevated to be the center of, if you like the universe because this is where God is going to dwell, right here. It's an incredible thought. It's where Christ humbled Himself the most, this humble place is going to become the capital. And ultimately it says the meek will inherit the earth. We don't float forever out in the clouds. Ultimately things happen here on earth. Go ahead. Hebrews 11:16, it says, "For he hath prepared for them a city." And this is talking about the New Jerusalem, not the International Space Station. People wonder, how can God make a city that will come down from heaven. Well, we got a city… We got a little city up there in the space station now. People believe man can do it, they don't think God can do it. In fact I heard this week in the news that Elon Musk's company with SpaceX that they finally successfully brought at least a dummy human up to space. So now they're going to start shuttling humans from America. We've had to pay the Russians to bring our astronauts up for years now since the space shuttle was retired. And everyone's talking about putting a plantation on the moon or on Mars, and we think man can do it. Well, God has a city in space. It says, they'll build houses and inhabit them. Are we going to just be floating on clouds like naked babies? No, we're doing real things. What else is going to happen? Oh, there's the naked baby. There it is. Yes, heaven is a real place. The Bible is pretty clear upon that. All right. Next question, what more do we know about the city? Now, we're going to go quickly through a number of things that we want to cover just to share some of the good news. Pastor Ross? Revelation 21:16, it says, "In the city lieth foursquare and he measured the city with the reed, twelve thousand furlongs. The length and the breadth and the height of it are all equal. Now, you have eight million people in New York City. Folk say, you know, there's probably no room in heaven for me. Here you've got a city 375 miles on each side, that's as big as the state of Oregon, one city. Are you aware amazing fact, that Dallas Fort Worth airport is bigger than Manhattan? The land on which you find the DFW Airport is bigger than the island of Manhattan, and there's eight million people there, so those… Don't worry about them not being, and he'll have skyscrapers. There'll be plenty of room. I hear there's more people that live below street level in New York City than the whole state of Montana. I don't know if it's true but it sounds really good. No, I did read that somewhere. Go ahead. Revelation 21:2 says, "And I John saw the holy city, the new Jerusalem, coming down from God out of heaven." Now, typically when we think of a city, that doesn't really get us excited because cities are concentrations of people, where you've got crime, and drugs, and horns, and traffic, but these are people where there is no sin, there's no death, there's no disease, it is going to be a beautiful place, the Bible describes it, and some of the things. It has beautiful walls, great and high and twelve gates. And each gate it says is made of one pearl. Just a quick amazing fact. A guy name Alan Golash was going through a basket of costume jewelry in an antique store in Rhode Island and he found this brooch, and he recognized it was worth more than the $14 that he paid for it. Turns out that it's two very rare Quahog purple pearls and it's called the... I think it's called the Pearl of Venus, and it was studded with diamonds and gold. I think it was worth $2 million, paid 14 for it. You know the story. Merchant finds a pearl of great price, he sells everything to get it. Is heaven going to be worth everything? What sin would you cling to that would be worth more than heaven? Revelation 21:21, it says, "The streets of the city are made of pure gold." Fifteen says, question 15, what does the Bible say about the city's water and food supply? Revelation 22:1, "He showed me a pure river of water of life." And as far as the food supply, Revelation 22:2, "On either side of the river, there was the tree of life which bare twelve manner of fruits." So if you got 12 manner of fruits each month, that's 144 fruits. Right? And that's better than 31 flavors of Baskin Robbins. But it said, the tree, singular, is on either side of the river. The only way I reconcile that is, you ever seen tree branches where they grow together, Ficus and some others do that. And matter of fact, I was cutting the tree just on the church property the other day, and I found a place where the oaks grew together and it has circle in the middle of it. And I cut it and I saved it. I think the tree is going to grow together at the top and the roots go together at the bottom and it's a massive tree because all the saved eat from it. Think bigger than redwood, and the river flows through it from the throne of God. Talking about the tree, it says, as Pastor Doug, you mentioned, it yields fruit every month and the leaves of the tree are also for the healing of the nations. That's a quote from Ezekiel, I think it's Chapter 40 where it says, "And the leaves of the tree are for medicine." And it's saying that everything about this tree is good and everywhere the water runs. Ezekiel says, everywhere the water runs, things live. So it really is a river of life. Question 16, how will living in heaven be different than living here on earth? Well, we'll go back and forth on these, I'll tag team with you, I'll do A. "The eyes of the blind will be opened." "And the ears of the deaf will be unstopped." "And then shall the lame man leap as a hart," a hart is a deer like creature, "and the tongue of the dumb shall sing." That means, I'll be singing. And speaking of the animals, "They shall not hurt nor destroy." You want to hear an amazing fact. You ever heard the expression, lions, and tigers, and bears online. Then you've been watching Wizard of Oz, if you heard that. They are actually, they raided a drug lord's home in Atlanta and in the basement they found these three, a lion, a tiger and a bear living in squalor. But they were, they had been together since cubs and they put them and Nature Reserve adopted them and they are all friends. They all get along, a lion, a tiger, and the bear. In the heaven will the animals eat each other? And by the way, they call them BLT, Bear, Lion, Tiger. Your turn. It says, Isaiah 11:6, "The wolf also shall dwell with the lamb, and the little child shall lead them." Yeah. There's nothing going to hurt or destroy. Are we going to kill animals and eat them in heaven? Everyone's gonna be vegetarian there, even the animals are vegetarians that each straw like the oxen. Shouldn't we get ready for that now? Talking of the vegetation, the desert shall bloom as the rose. There would be no desolate place, everything is going to be… The worst places on earth now will be our garden there then. It says the inhabitant will not say I am sick. Think about the real-estate we're going to save with no hospitals, no cemeteries and no golf courses. Some people just turn channel. Question17, will sad or painful memories from this life trouble people in heaven? It promises, the former will not be remembered or come into mind. Does that mean we're going to forget that God saved us? No. we will always remember the redemption, but no painful memories. As the ceaseless ages roll by, wave after wave of glory, pleasures at His right hand for ever more where painful memories will be absorbed. You know how time heals, you heard that expression. When you go through a hard time and you think, I'll never get over this. And after a while, it's fun when you find a teenager, they got a crush on someone, "Oh, if I can't have him, I'll never be happy." I see some of you are smiling. Okay. 1 Corinthians… Oh, then people say how, you know, I'm not going to recognize grandma in heaven, 'cause she is going to be young and how we're going to know each other in heaven. Will we recognize each other? Wanna read that one. 1 Corinthians 13:12 says, "Then shall I know even as I am known." We will not have less discernment in heaven, we will have more discernment to identify the people that we love. And, you know, I see we're out of time, but I'm just going to race through some of these quickly. What are the thrilling promises does God give us regarding His kingdom? "The ransomed of the Lord shall come to Zion with joy, everlasting joy. Pleasures are at his right hand for evermore. Boys and girls playing in the street." Will there be children in heaven? So a child will play on the hole of a venomous serpent and not be hurt. "They'll run and not be weary, walk and not faint. Mount up with wings like eagles." Will we be able to fly? Like the angels, you know, that song Rock of Ages, it says, we saw two worlds unknown. I know it's not in the Bible, it's a song, but I believe it's true. Go ahead. Revelation 21:3, it says, "God himself will be with them." Can we adequately describe God's new kingdom with words? 1 Corinthians 2:9 says, you know this verse, "Eye hath not seen, nor ear heard, neither entered into the heart of man the things that God is preparing for those that love him." You can't imagine what He has for us. But the only thing that will keep you out of heaven is sin. Nothing will enter into that city that will defile nor will there be any lie, liars on the lake of fire, the Bible says. So if we want to be there, I want to be there, don't you? We've got to deal with sin. And the answer to that is, "He that comes to me, he that overcomes will inherit all these things." Christ promises that if we confess our sins to Him, if we repent, turn from our sins, confess our sins, he will cleanse us from all unrighteousness. And then we are adopted as His children, we can be in His kingdom. We hope that's a prayer of those that are watching. Pastor Ross, remind us of our special offer? 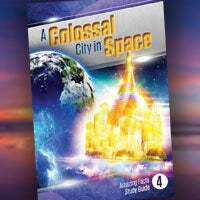 Our free offer today is called "A Colossal City in Space," it's part of the Amazing Facts Study Guide series. In order to receive this, call 866-788-3966 and ask for offer number 115, or you can text the code "SH122" to the number 40544, and you'll be able to get a download of the study guide. Well, thank you, friends, we've run out of time for our study today. God willing, we will study His Word together with you again next week. God bless. Don't forget to request today's life changing free resource. Not only can you receive this free gift in the mail, you can download a digital copy straight to your computer or mobile device. To get your digital copy of today's free gift, simply text the keyword on your screen to 40544 or visit the web address shown on your screen. And be sure to select the digital download option on the request page. It's now easier than ever for you to study God's Word with Amazing Facts wherever and whenever you want and most important, to share it with others. Have you ever heard the expression before they eat like a bird, talking about somebody that has a minuscule appetite? Well, you might want to think twice the next time you use that expression. For example, take the humming bird. In order for it to maintain its incredible metabolism, it has to eat about 50% of its body weight every day. To put that in perspective, if a 100 pound woman was to eat like a humming bird, she would have to eat 50 pounds of sugar a day just to maintain her body weight, imagine that. Maybe you don't want to imagine that. Or perhaps you want to consider this another way. The humming bird typically consumes between four to seven calories a day, on the other hand a human about 3,500 calories a day. But if you were to eat like a bird, a humming bird, you'd have to eat over 150,000 calories a day. Oh, that's like a man of 170 pounds that would be eating 3,000 Oreo cookies. Under normal conditions, a humming bird needs to eat every five or ten minutes. But there is actually one time during the year, the humming bird will eat its entire body weight every day. You see once a year they make this migration 500 miles across the Gulf of Mexico from Texas to the Yucatan Peninsula. In order to do that, the humming bird feasts on nectar and gorges themselves on this nectar for about a week, doubling their body weight. That's the only way they can store enough calories to help them with their 70 wing beats per second or roughly 4 million wing beats on that journey. You know, in the same way, friends, as we near the end of time, we need to be feasting and gorging ourselves on the nectar of God's Word. We've got to be able to have that strength to get us through the times of trouble that are ahead. So when it comes to the Bible and your personal devotions, if you're going to eat like a bird, eat like a humming bird.